Mumbai Indians returned to winning ways as they defeated Royal Challengers Bangalore by five wickets in the 31st match of IPL 2019 played at Wankhede Stadium, Mumbai on Monday. With this win, MI have retained their position in the top half of the IPL points table, and they look good to seal a playoff spot this season. 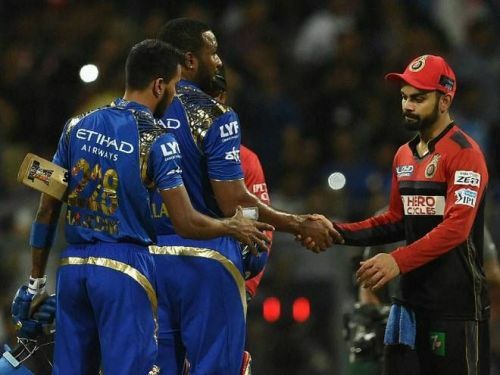 MI captain Rohit Sharma won the toss and decided to field first, and Jason Behrendroff soon got the big breakthrough by dismissing RCB captain Virat Kohli cheaply. Parthiv Patel then played with positive intent to put pressure on the Mumbai Indians bowlers. At the end of six overs, Royal Challengers Bangalore were 45 for 1. After the powerplay overs, Hardik Pandya dismissed Parthiv for 28. AB de Villiers and Moeen Ali then took some time to settle before launching into a spate of clean hitting. De Villers reached his fifty off 41 balls while Ali reached his half-century off 31 balls. Lasith Malinga dismissed Ali for 50, but not before he and De Villiers had added 95 runs for the 3rd wicket. Malinga then dismissed Marcus Stoinis in the same over. But De Villiers played a brilliant knock, scoring 75 off 51 balls, and was only run out in the last over. Royal Challengers Bangalore scored 171 for 7 at the end of their 20 overs. During the chase Rohit and Quinton de Kock got the team off to a flying start, hitting several boundaries against the new ball bowlers. At the end of six overs, the two had taken the team score to 67. Ali got the breakthrough by dismissing Rohit with a beauty of a delivery. Rohit and De Kock had added 70 runs for the opening wicket. Ali then dismissed the other opener De Kock too, which put a little pressure on the MI batsmen. Suryakumar Yadav and Ishan Kishan played aggressively, adding 33 runs for the third wicket in quick time. Yuzvendra Chahal got the wicket of Kishan for 21, which brought Krunal Pandya to the crease. Chahal again struck by dismissing Yadav for 29 to give RCB some hope of winning the match. But Hardik Pandya then arrived and showed his class with the bat, remaining not out on 37 off 16 balls to help Mumbai Indians register a five-wicket win. Brief scores: MI 172 for 5 in 19 overs (Quinton de Kock 40, Hardik Pandya 37*, Moeen Ali 2/18, Yuzvendra Chahal 2/27) beat RCB 171 for 7 in 20 overs (AB de Villiers 75, Moeen Ali 50, Lasith Malinga 4/31) by 5 wickets.